With an endless stream of violence flooding movie screens for years now, and with the immediacy of television reporting of wars and natural disasters, a diminished response might be expected when new calamities occur. September 11 put such an expectation to the test. The audacity of the attack, the scale of destruction, and the horrific loss of civilian lives was vividly telecast for the world to see, even as it was happening. No one could fail to be moved by the events of the day. A powerful nation was made to feel vulnerable. There was, of course, a surfeit of reaction in the media, but the words quickly sounded cliched and seldom approached the impact of the visual images. It takes time, they say, for such events to be put in perspective. But there is value as well in recording the immediate observations of the time, for whatever value their spontaneity might provide, especially for those in the future who will look back and try to grasp what happened. 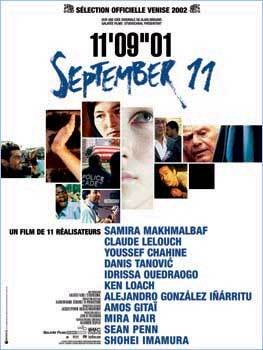 That, presumably, was the intent of producer Alain Brigand in inviting 11 ranking directors each to make a film of 11 minutes, 9 seconds, and one frame (11/09/01) around the events of that day. The result is a compilation of widely diverse views from observers around the world, some interesting, some not, some political, some emotional, some relevant, and some less so. For Americans, perhaps the most useful aspect of the films are the perspectives from non-American viewpoints. Danis Tanovic (No Man’s Land), expresses a response from Bosnia, clearly sympathetic; but his film makes clear that the U.S. tragedy for them is one more in a long list that includes the genocide at Srebrenica. Veteran Egyptian director Youssef Chahine (Destiny), clearly conflicted over the issue, speaks both with the ghost of a U.S. Marine victim of the 1983 Beirut terrorism and with the parents of a suicide bomber, deploring the vicious circle of violence that divides them. Samira Makhmalbaf (The Apple, Blackboards) shows Afghan immigrants in Iran desperately making bricks to build shelters against expected retaliatory bombing by the U.S. A teacher tells them, "You can’t stop atom bombs with bricks." And when she asks the young children in her class for a moment of silence for the victims of 9/11, they ignore her as they discuss God and what God might or might not do. Ken Loach (Sweet Sixteen, My Name is Joe), one of Britain’s finest filmmakers, offers an anti-American screed about the role of the U.S. in Chile, admittedly a shameful history of Nixon/Kissinger meddling in the affairs of a foreign state, overturning a democracy to be replaced with a ruthless military dictatorship. But Loach’s is too narrow a response to 9/11, too much a suggestion that the attacks were somehow justified by history. Amos Gitai (Kippur, Kedma) suggests that the Israelis are so caught up in their own experience of violence that they have no room left to consider victims abroad. Mira Nair (Monsoon Wedding) tells a somewhat sentimental story of a young Muslim in New York who is missing. His mother fears he has been arrested, caught up in the overreaction of the Bush administration towards resident "foreigners," but it turns out he was a hero at Ground Zero. Sean Penn (The Pledge) goes overboard with treacly sentimentality in his segment; it’s nothing short of an embarrassment. Idrissa Ouedraogo, from Burkina Faso, tells of a group of young boys intrigued with the idea of capturing Osama Bin Laden for the reward money. His film has a certain charm, but seems a lightweight response to the challenge. Similarly Claude Lelouch (Les Miserables) tells a romantic tale of a deaf-mute woman in New York who is about to break off with her boy friend out of fear he will leave her first. She is unaware of the disaster playing out on her television screen, a disaster which will change things in unanticipated ways. It’s a nicely told story, but seems ancillary to the purpose of the film. Overall, this is a disappointing collection of films, especially considering the great talents involved. The pieces offer little new insight and less solace. Their failure is likely as much a difficulty of the very short form as of the short-term, unseasoned response to a world-shaking event.